Hand carved single & double bed headboard. Wall art plaque made of tropical reclaim teak wood from Thailand. Single & Double bed headboard or decorative carved wooden wall art panels are made from reclaimed teak wood and because the items are handmade, please expect a slightly difference. They might not come with the exact squares as described as the carvers rough cut slats that are approximately the same size. They later lay the slats side by side. The pattern is transferred by hand. Our artisans make a panel by drilling the holes and thread finger saws through the openings of the pattern. They then carve it by hand to create three dimension effect. After that they cut the panel into totally 4 pieces of 30 cm sections that need to be assembled side by side and they all fit together. They lastly scrub the panel by sand papers and attach two embedded hangers to the back of each panel. As it is made by hand thus each product is an imperfect art but impressively unique. The process of making the carved panels with drawing, drilling and finger sawing is unique and representing the individuality of each artisan. The artisans take time to elaborately create their own carved panels. They use the traditional skill of hand making that has been passed down generation to generation, therefore the panels may not line up together perfectly. To hang, start with placing the middle panels and work your way outwards. The outside edge might not look like a perfect square and the pattern may not line up perfectly after assembling the panels side by side. 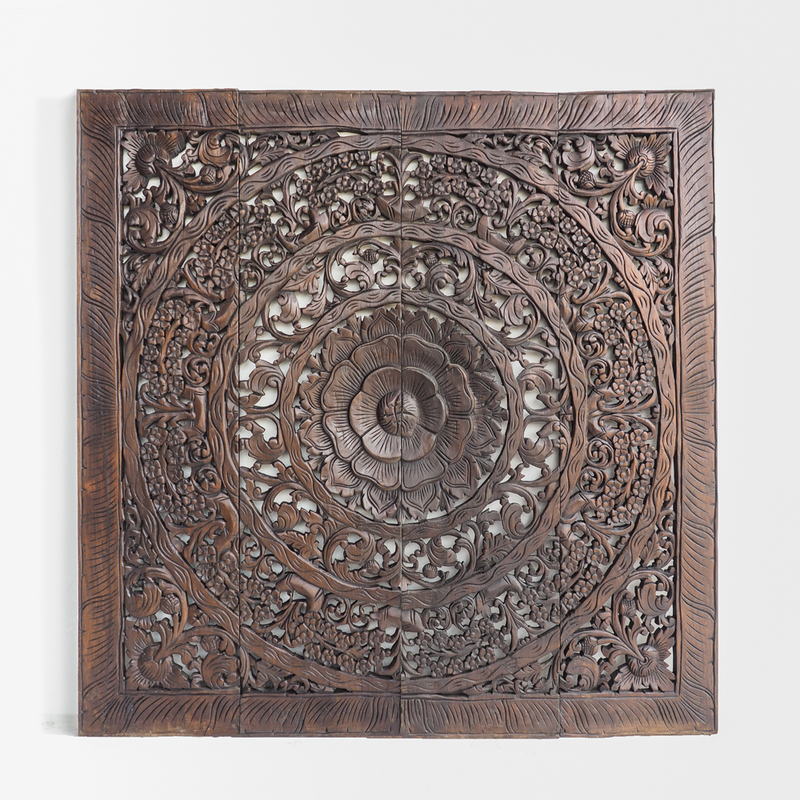 Single & Double bed headboard or decorative carved wooden wall art panel. Bring a sense of uniqueness with oriental design, adding luxurious and beautiful decorative patterns and character to a creative and contemporary room. A panel consists of 4 pieces of 30 cm panels that have been cut out of the original panel. This would ease the shipping and mounting. It also comes along with the recessed hanging hardware. I’m very impress by how professionally they deal with shipping. It was very fast. The painted the panel in the exact color that I asked for. They have the outstanding service. Highly recommended.